It was the final days of the school year, late June, when one of my sixth grade students asked in the middle of class: Do you think President Trump will respond to what we wrote? Even now, I bite my tongue. Do you really want him to, I asked in my head. My students took part in the Letters to the Next President project, even though they were too young (under 13 years old) to be part of Educator Innovator’s online initiative. We did it on our own, using the Educator Innovator’s framework for choosing topics, doing research on a topic, writing to the next president (at a time when we did not know who would win the election). 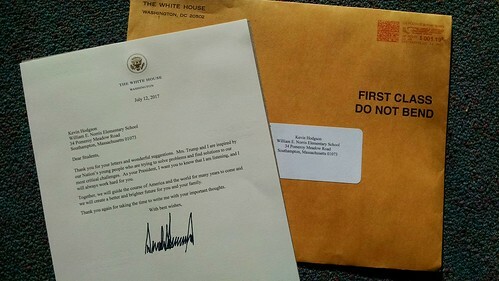 Then, I went to my classroom this week to bring in some books and do a little organizing before the start of our new school year coming up a bit too fast, and there on my desk was an envelope from the White House, postmarked mid-July. Trump responded, or rather, his staff responded in an upbeat tone. This entry was posted in 2NextPrez, my classroom. Bookmark the permalink. Yes, peace please. I actually think Trump could have written (or dictated) those words. In his self-importance, he’s delighted to have the students’ attention. 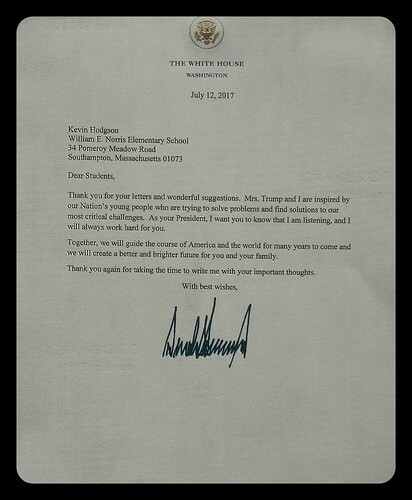 Your sixth graders are not yet caught up in the left-right battles that their parents are fighting and a letter from the President can be very inspirational. Maybe one will go on to be a future president or world leader and fix those problems that his/her parents failed to fix.